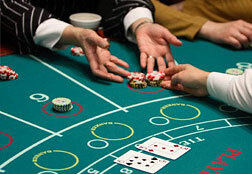 Baccarat is a quite simple game popular both online and in the land casinos. The reason for the game being so loved by players is the fact that it offers almost the lowest house edge if compared to other games. Though most of the profit from this edge is gained only by high-stakes players, you can still enjoy the game even if you play for fun money. The usual baccarat rules involve 6 decks of 52 cards, still there are games with different number of decks, which affects the probabilities. The baccarat game has only three possible results - "Player", "Banker" and "Tie". The terms do not refer to the player in the game or the house, these are just the options the player can bet on in the game. That is right, the player can bet on three possible outcomes of the hand, but we'll talk about this a bit later. Specially for those who want to know how to play online baccarat we have created a step-by-step guide to this game. Follow to the page and learn how to play this fantastic game. You can practice by playing our free baccarat game for absolutely free. How to play baccarat offline? 1. The game starts with a betting round when all the players place bets either on player, banker or tie or altogether. The dealer than announces "No more cards" and gives the shoe to the player at the first closest seat to the dealer right. 2. The right to deal the cards from the shoe moves around the table. The shoe can be passed to another player if the first player does not wish to deal. The same person may be dealing the cards over and over as long as the banker is winning. 3. The player who performs as the dealer places 2 cards face down under the shoe (these will be banker cards) and deals the player with the highest bet two face down cards (these will be player cards). This player (with the highest player bet) takes a look at them and returns the cards to the dealer. Then the dealer flips over the cards and announces the hand totals. If the game is online baccarat, the cards are all dealt face up. The odds of the game are the same. 4. In case the player and the banker have 8 or 9 (which is a natural), they stand. If the player total is 5 or less than 5, he may be dealt another card (go to Baccarat Third-Card rule). 5. All players may or may not be dealt a third card. All those that won are paid out their wins and all the losing bets are collected. The player who deals (not a casino employee) is only the person that deals the cards. 6. The scores are compared and the hand with the highest score - wins. Banker bets pay 19 to 20, player bet pays even money, tie pays 8 to 1. If the player and the banker have equal score, they push. In case player/bank has a total of 8 or 9, no cards are drawn further. The hand is a Natural. If player's total equals or is less than 5, the hand is dealt a third card. If the player does not draw a third card, the bank stands on 6 or more and draws on 5 or less. If the player takes a third card, the bank decides on whether to take a third card according to Bank's third-card-rule to the right. If the bank's total is 3, the bank draws a third card if player's third card is not an 8. If the bank's total is 4, the bank is to draw a third card if the player's third card is not a 0, 1, 8 or 9. If the bank's total is 5, the bank draws if the player third card is a 4,5,6 or 7. In case bank's total is 6, the bank will draw a third card if the player/s third card is a 6 or 7. The bank stands on a total of 7 or higher. Below you can see a table with detailed rules on a third card. The first table (Player's Score) stands for situations when the player is going to get a third card. The second chart stands for banker decisions on different hands with different player's third cards. You can print out this table either as a part of a whole page (by clicking on a Print icon on top of the page) or by saving this image and than printing it out.